Software Engineering researchers are constantly looking to improve the quantity and quality of their research findings through the use of an appropriate research methodology. 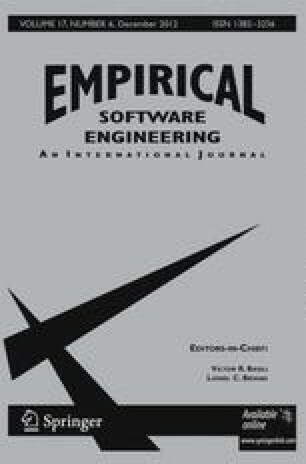 Over the last decade, there has been a sustained increase in the number of researchers exploring the human and social aspects of Software Engineering, many of whom have used Grounded Theory. We have used Grounded Theory as a qualitative research method to study 40 Agile practitioners across 16 software organizations in New Zealand and India and explore how these Agile teams self-organize. We use our study to demonstrate the application of Grounded Theory to Software Engineering. In doing so, we present (a) a detailed description of the Grounded Theory methodology in general and its application in our research in particular; (b) discuss the major challenges we encountered while performing Grounded Theory’s various activities and our strategies for overcoming these challenges; and (c) we present a sample of our data and results to illustrate the artifacts and outcomes of Grounded Theory research. We thank all the participants of our study. This research is generously supported by an Agile Alliance academic grant and a BuildIT PhD scholarship (NZ). Thanks to Dr. George Allan for his help. A process which allows the researcher to collect, code, and analyze the data and then decide what data to collect next. The first step of data analysis; starts by collating main points from raw data which are then assigned a code. A phrase that summaries the main points in 2 or 3 words. A process where codes arising out of each interview are constantly compared against the codes from the same interview, and those from other interviews and observations to find common patterns in data. A higher level of abstraction produced as a result of applying constant comparison on codes. The next level of abstraction produced as a result of applying constant comparison on concepts. The ongoing process of writing theoretical notes throughout the GT process. Memos capture the conceptual links between categories as the researcher notes down their reflections on different categories. Several categories emerge as a result of data analysis and the one that is able to account for most variations in the data and relates meaningfully and easily with other categories is called the Core Category (Glaser 1978). A coding procedure where the researcher codes selectively for the core category and only those categories that are closely related to the core. Once the core category is established, the researcher ceases open coding and uses selective coding. When further data collection and analysis on a particular category leads to a point of diminishing results—no new insight into the category is generated—the category is said to have reached theoretical saturation (Glaser 1992). The researcher can then stop collecting data and coding for that category. As the theory starts to emerge, the researcher can conduct extensive literature review to see how the literature in the field relates to their emerging theory. The process of conceptually arranging the theoretical memos once the researcher has nearly finished data collection and coding is almost saturated. Sorting of the memos forms a theoretical outline (Glaser 1978) and should be done on a conceptual level resulting in an outline of the theory describing how the different categories relate to the core-category. A coding procedure where the researcher uses one of the the several theoretical frameworks (theoretical coding families) to describe how the emergent categories relate to each other as a hypotheses to be integrated into a theory (Glaser 2005). The final step in GT is writing up the theory, which follows the theoretical outline generated as a result of sorting and theoretical coding.